It’s a kid-focused week for Blu-ray Disc and DVD releases. 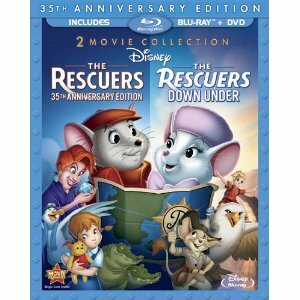 Start with Disney’s The Rescuers: 35th Anniversary Edition that includes both The Rescuers and The Rescuers Down Under in a three-disc Blu-ray/DVD Combo. There’s also the Pocahontas Two-Movie Special Edition that includes Pocahontas and Pocahontas II: Journey To A New World, also packed in a three-disc combo with Blu-ray and DVD. The Aristocrats and Disneynature: Chimpanzee are also two great films for kids that hit shelves today. For adults, there’s the newest Sacha Baron Cohen film The Dictator in a BANNED & UNRATED edition. And, the first mainstream hacker movie Wargames starring Matthew Broderick gets a high-def release on Blu-ray this week. View our picks below or see all new Blu-ray Disc releases this week at Amazon.